Without the intent of overselling this simple, seasonal side dish, I will mention that my husband recently purchased an acorn squash so that I would make this recipe. Initially, I thought this purchase seemed odd, as he is not particularly fond of orange vegetables. He said that he remembered this recipe from last fall and suggested I mention here that he is quite a fan. Well suited to a weeknight pork or beef dinner, this healthy and satisfying side is equally perfect alongside a Thanksgiving turkey. For easy last-minute assembly, cut the squash earlier in the day and store in an airtight container or plastic bag in the fridge until ready to cook. 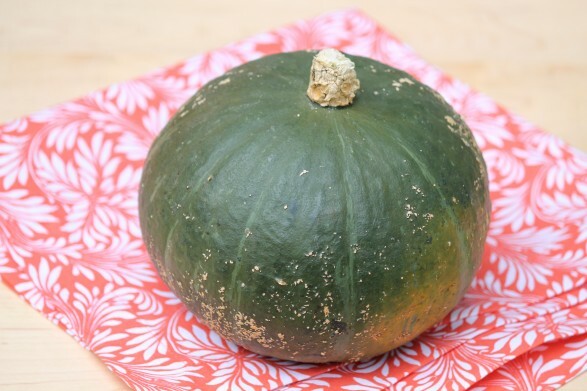 Kabocha squash is similar to other winter squashes and has a delightfully creamy texture. 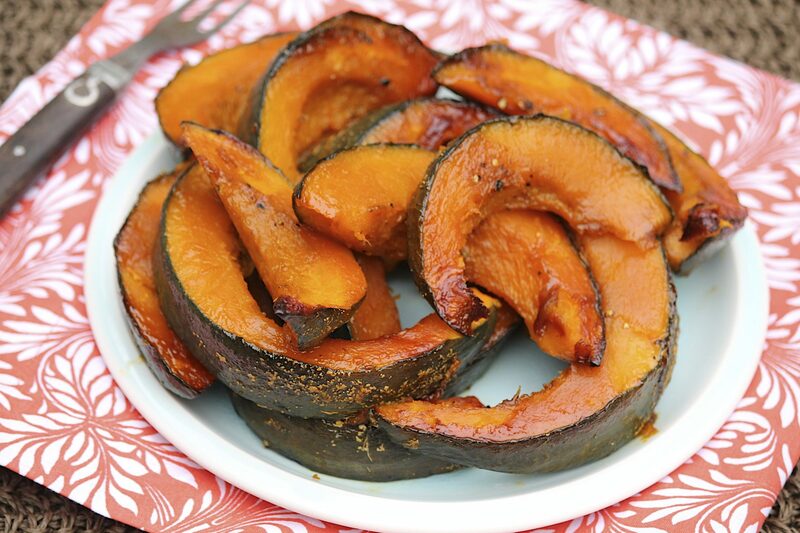 Delicata and acorn squash are also delicious and, like kabocha, do not require peeling. The skin softens when cooked and is completely edible. Peeled butternut squash may also be used. If you have more than 2 ½ pounds, I recommend doubling the topping ingredients. Yields 4-6 side dish servings. Preheat the oven to 350 degrees F. Liberally grease a baking sheet and set aside. Spread the squash pieces, cut sides down, in an even layer on the baking sheet and bake for 25-35 minutes or until just tender. Precise time will depend on oven and thickness of pieces. Use a sharp knife to test for doneness. 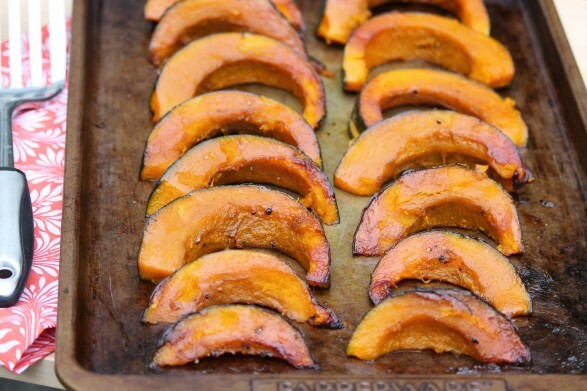 Look for a golden brown color on the side touching the baking sheet and a hint of firmness remaining in the squash. I adore the use of coconut oil in this recipe. It creates great flavor and aroma without tasting overtly of coconut. A hint of pure maple syrup is delightful as well, but honey and olive oil may be used in place of these ingredients. A sharp chef’s knife makes cutting winter squash easier. However, if you struggle to do this, you may microwave or bake the whole squash just long enough to slightly soften. Pierce the skin with a knife first. In this case, simply adjust the later baking time down slightly. To achieve the golden brown, caramelization that tastes so good–and this applies to all veggies, not just squash–lay the cut vegetables on an oiled baking sheet with the flat side down. It is the side that is in contact with the hot metal sheet that will brown first. Roast, undisturbed, until the early side of the estimated cooking time. Then, using a metal spatula, peek at the undersides to see if they are browning. If the pieces are sufficiently browned but not completely cooked, flip them over. If the pieces are not quite cooked and could use more color, continue roasting without flipping. You will get to know how long this takes in your oven. I roast most vegetables until they are just tender without flipping. In many ovens, keeping the veggies in the oven until both sides are golden will result in a mushier vegetable than may be desired. In case you are not familiar with it, this is what a kabocha squash looks like. (Buttercup squash are very similar but have a flatter top.) Along with acorn and delicata squash, these varieties are excellent options for this recipe as peeling is not necessary. The skin is edible–nutrient rich, too–and will soften as it cooks. Butternut squash is a delicious option, too; simply peel first. Deelish! Will definitely be including this for the holiday. To you, too! I hope you enjoy! Love, love, love acorn squash. Made this last night and it was so good. Thank you! This was great! I need to work faster, my coconut oil was starting to harden before I got it in the oven! I even sprinkled a little bit of brown sugar over them after I flipped them. My kids liked them too! Can’t go wrong trying one of your recipes! I just love how the flavor of the coconut oil and maple syrup complement the squash. So glad you enjoyed, too, Christie! I’m so glad you’ll be making this, Beverley. Hope it’s enjoyed by all and sending love to you, too!